As Washington once again engages in a heated political battle over immigration policy, it’s worth reminding ourselves just how much the country and its politics have changed since passage of the law that largely created today’s system. Fifty years ago, the Immigration and Nationality Act dramatically changed the makeup of the country by ending a quota system based on national origins in favor of one that took into account occupational skills, relatives living in the U.S. and political-refugee status. Despite the long-term impact of the 1965 law and the highly partisan tone the issue has taken on today, immigration was not highly divisive a half-century ago, and the American public paid it little heed. Of course, a lot was going on in 1965 to occupy the public’s attention – Vietnam and civil rights, to name just two mega-issues. While Americans were much quieter about immigration back then, the public was divided about the right level of immigration. A June 1965 Gallup poll found that 39% preferred maintaining present levels, almost as many said they should be decreased (33%), and only a few (7%) favored increased immigration. But in the end, a majority of the public approved of changing the laws so that people would be admitted on the basis of their occupational skills rather than their country of origin. And after the Immigration and Nationality Act was passed, fully 70% said they favored the new law. One can only wonder what reactions would have been had Americans known how much the new law would change the face and complexion of their country in years to come. In 1960, the foreign-born share of the population was just 5%. By 2013, that figure had more than doubled to 13%. Even more dramatically, the ethnic composition of immigrants has changed. In 1960, the overwhelming share of immigrants were of European origin and few were Latin-American/Caribbean or Asian. By 2013, a census survey found half of immigrants were Latin-American/Caribbean and 27% were Asian, while the European share of the immigrant population had fallen to a mere 13%. Looking ahead, those changes will become even more pronounced. 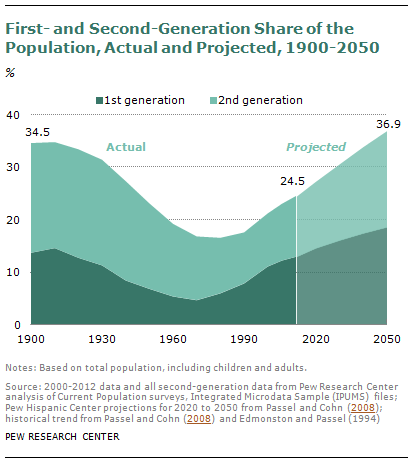 Based on census data, the Pew Research Center projects that the first- and second-generation immigrant segment of the American population will swell to 37% by 2050, compared with 15% back in 1965. This roughly matches the first- and second-generation immigrant percentage of the public at the turn of the 20th century, which was a high point in American immigration. Indeed, immigrants now come from different parts of the world, and they make up a larger share of the American public. This has taken some getting used to on the part of the American public. In the 1990s, by wide margins, Americans saw immigrants as burdens on society rather than as strengthening the country through their hard work. Also, many thought that the growing number of newcomers would threaten traditional American values and customs. But slowly, opinions have begun to change over the course of the past two decades. By 2014, a healthy 57% majority had come to the opposite point of view, saying that immigrants strengthened the country through their hard work; and just 35% now say that the increasing number of immigrants is threatening American values. Given these shifts, it’s not surprising that 50 years after the Immigration and Nationality Act, the public’s bottom line about the law is a thumbs-up. When polled about the desired level of legal immigration, Americans today give a decidedly more positive response than they did back in 1965. Most say either keep immigration at present levels (31%) or increase it (25%), while a minority (36%) say the level of legal immigration should be decreased. It is important to recognize that a heated debate about immigration these days, at least from the public’s point of view, is not about the level of immigration, or where people come from, but how to keep out unauthorized immigrants and what to do with those who are now here.